The photo above was taken by my girlfriend Laura LaBrecque during the most recent blizzard in Boston. 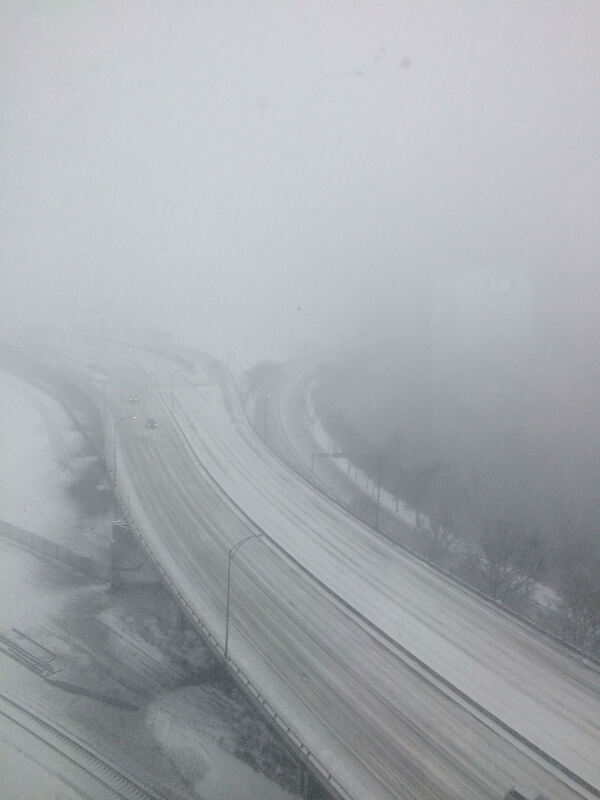 We spent our snow day watching The Sopranos and snacking, but I couldn’t get over how the city disappeared from view. This photo was taken from my bedroom window, which overlooks the Mass Pike, the neighborhood of Allston, and the riverside part of Cambridge. Yet aside from the most immediate stretch of road – which was eerily yet justifiably clear of traffic during mid-day – the rest of my view was absent. This led me to think about anonymity. I was talking with my friend Chris Dela Rosa during our time at Boston University when he shared one of his tips for getting across campus faster. He told me that by tossing on a baseball hat and a pair of sunglasses, he doesn’t get bothered. People do not recognize him and he is able to walk without interruption from one end of our campus to the other. I would quote him directly, although I was not taping this casual conversation with the thought I’d need it two years later. However, I still recall this conversation two years later because it fascinates me. I am incapable of hiding in plain sight. Over the past few years, I have had more conversations about what it is like to be in my wheelchair while retaining the ability to walk than I can properly count. A question that I have never been presented directly, yet thought about often, is just how recognizable I am. I can promise you, this is not narcissism, although I am a narcissist. I have strawberry blonde-auburn-red-brown hair – the correct classification of my hair color is one of the most often debated topics between my friends and I. I wear tortoise shell glasses. I have a beard that is considerably redder than my hair. When standing I am only 5’3″, which makes me by far the shortest male in any of my friend groups. Oh, and there’s the wheelchair which I propel with my legs. People tend to recognize that as well. As a result, there is no confusing me for someone else. Meanwhile, I mistake my friends or inadvertently brush them off almost every day. I am extremely bad at recognizing friends of mine wearing sunglasses unless they have a defining physical characteristic – I can still recognize Justin Alston from the Men’s Basketball team in a crowd, mostly because at 6’8″ he’s the one towering over the rest. When I am walking home in the afternoon, the setting sun is blinding while walking west. At night I am similarly blinded by reflections of car lights on my glasses. This is my blanket way of apologizing if I don’t immediately recognize my friends, although it can also fill in for me pulling a blank – two birds, one stone. Chris caused me to consider, and ultimately realize, something odd about myself. I do not have the same anonymity as my friends in certain situations. For example, if I were walking to class with coffee over my shirt, anyone that has seen me immediately knows it’s me with Starbucks on my person. If I was picking up 12 boxes of Girl Scout cookies, there is no discreet way for me to transport those Thin Mints home without confirming that I purchased a bushel of cookies. This isn’t exactly a problem in the traditional sense. In reality, I’m complaining about not being able to quietly purchase inordinate amounts of snacks. This is the definition of a “me problem.” But this is where I took it a step further. We are currently living in a new age of digital technology that didn’t exist when I was 2, or 12, and is rapidly evolving while I’m 22. That said, it has become increasingly more likely that certain personal details of mine have been spread around the internet. This is a cost for having accounts with most social networking platforms and other shopping sites. The practice of selling information isn’t unique to someone like Spotify or Amazon, so it does not freak me out. This doesn’t freak me out because my email is both listed on this website and in the kicker for articles I’ve authored for BU Today. This is when I considered The Bachelor, and I need you to trust me that this will make sense in a second. This week’s episode saw the contestants bring Nick The Bachelor home to their families so he can get to know his potential in-laws and living situation. For all intents and purposes, I did not know what these contestants’ families looked like before, but I could (and likely would) recognize Corrine’s dad if I was shopping in Miami. These people did not sign up to have their likeness become national, yet that’s exactly what happened. There’s an almost certain chance that if you’re reading this, you have not appeared on a national reality show that would make you recognizable to most of the country. But let’s think in a smaller sense here. Almost every day I speak to friends that I made because they recognized me from posting on Facebook or from this blog, with one of them being Laura, who I’ve dated for two and a half years. We met in large part because Laura read Unbreakable before we first spoke and liked my personality. I liked her’s from as much as I could tell on Instagram, and that’s where this becomes interesting. The nature of social media channels is to share and publicize our lives. The ethics of this practice are debatable, and not necessary here, as I only intend to look at it as the reality of our lives that it is. I do not have private accounts on Twitter or Instagram so anyone reading this article would be able to find a picture of me or the ribs I made for Super Bowl Sunday if they wanted. Even if we removed the physical characteristics that make me most recognizable – put me in a hoodie and sunglasses with shoe lifts and no chair – I am still not technically invisible. I am a public person because almost everyone now is. The only way this could be true is for the segment of the population that does not use Facebook or the Internet at large, which would suggest that we are focusing on an older demographic. Children would technically fit this description as well, as every parent I know has posted pictures of their kids online, including my own parents, despite the fact that my dad has no social media accounts; instead, he looks on my mom’s Facebook with her. I do not necessarily think this is a bad thing. I think it’s different, but not necessarily bad. You can make arguments either way. For every criminal it is easier to find, it is more accessible to find personal details about anyone around us. What I have realized is that I have a strange view on this all, because I live publicly both by choice and by nature. I can hide my personal details online as much as I want, but that does not change the fact that my friends could spot me from two blocks away just from a glance of me Flinstoning my wheelchair to lunch. This is what I thought about when I looked out at a blizzard and realized that no one is truly anonymous and no one can hide in plain sight. Chris may have been spot on about getting from class to class, but not about humanity. He now works for JetBlue, so the fact this thought came to me during a blizzard, which grounded a number of planes out of Boston – a JetBlue hub – is some sort of backward irony I don’t quite understand. Yet he had a point, one that’s stuck with me at least. Perhaps the only real way to hide in plain sight would be to walk outside in said blizzard, where not only do you disappear but so does the rest of the world.